As I've mentioned on the blog, we've had some engine issues. 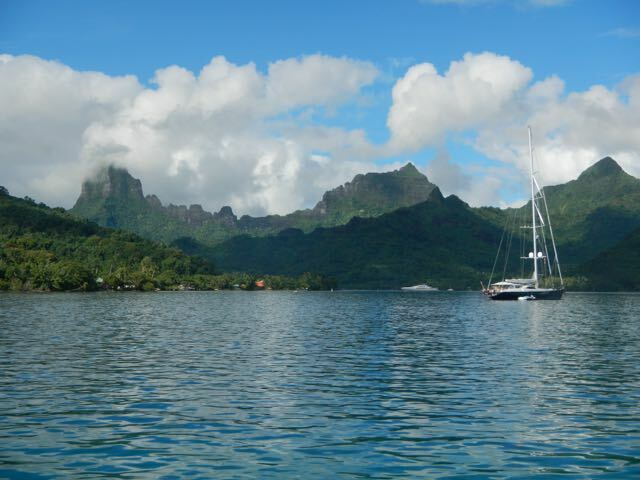 On our sail from Opunohu Bay, Moorea, to Papeete, Tahiti, a distance of only 17 miles, our engine quit. Despite my best efforts at a fix, I was unable to get it running again. 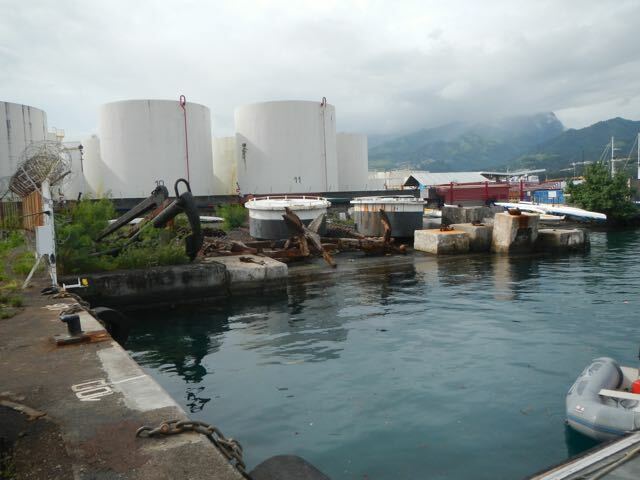 We received a tow from inside the entrance of the lagoon to a ratty floating dock in Marina du Papeete. Still, we're in down town Papeete, the breathing heart of French Polynesia. Not too bad a place to be stranded! 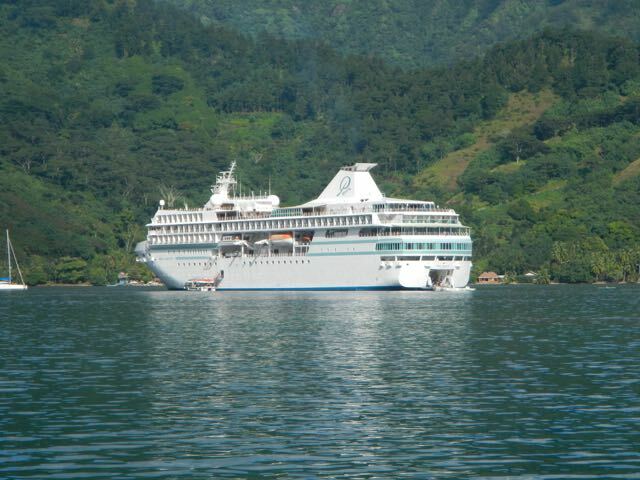 The Paul Gauguin, a large local cruise ship, joined us in Opunohu Bay. Guests are ferried to shore in "lighters" that load from her stern. Opunohu Bay in sunlight, a sight that we didn't enjoy most of our visit. Everyone says that the season has been abnormally wet: El Niño strikes again. Technical stuff: This is our anchor, a 65-pound Mantus. I took the photo from our deck through 17-feet of water. The anchor is clearly visible on the bottom. The shank is protruding at right and the "roll bar" is almost vertical in the photo's center. I was surprised that it was so clear. 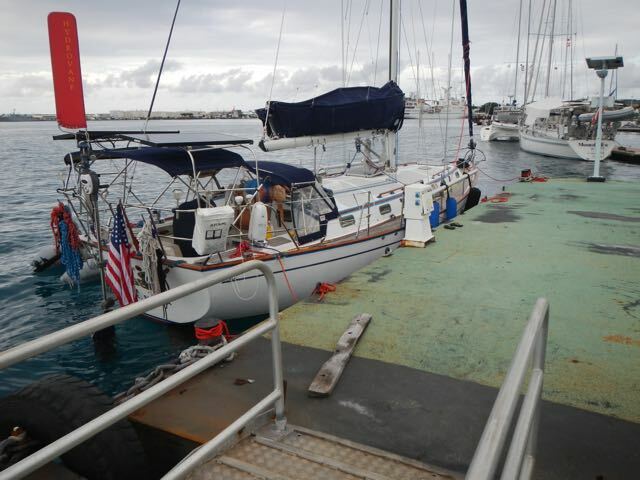 The anchor held for two days of raucous winds. 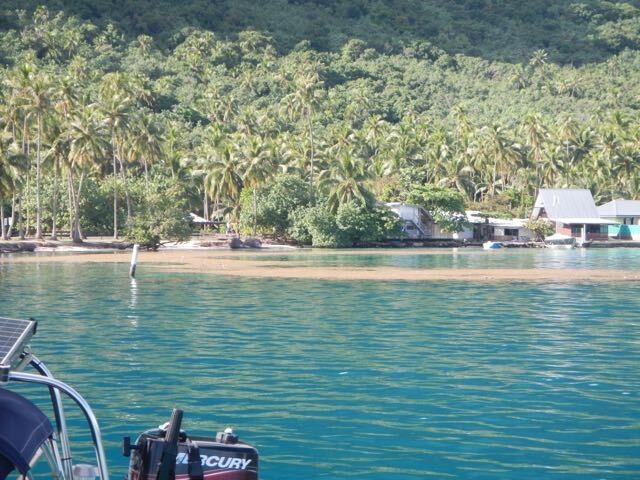 Our anchorage at Opunohu was crowded by Pacific standards, hosting 17 other boats, all on anchors. This is a great shot of a stream dumping red mud into the waters. I've shown several photos of this fresh water providing an opaque red layer. 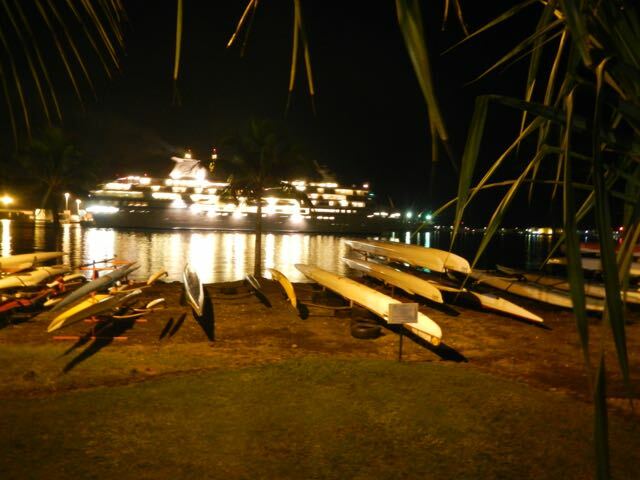 We're in Papeete! As it turned out, this is a strictly prohibited French Navy area, although there was no way for us to know: no signs, no warnings. The enormous anchors are for the large mooring buoys used for the huge mooring buoys nearby. 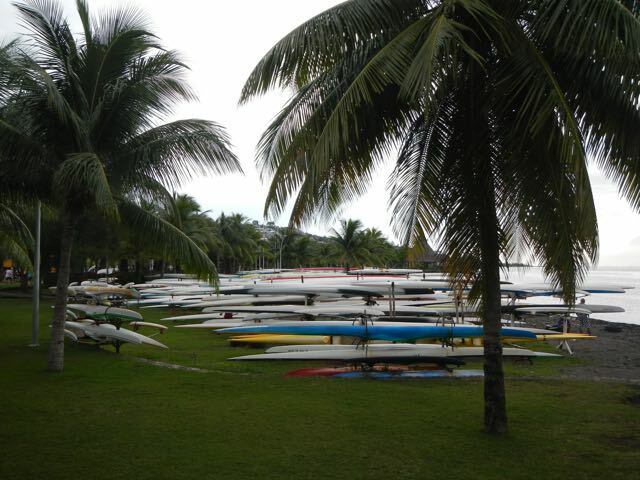 Our dinghy at right. Zup with this boat? Bizarre design, in my opinion, but she's being used. She seems top-heavy and with a lot of windage on her stern. 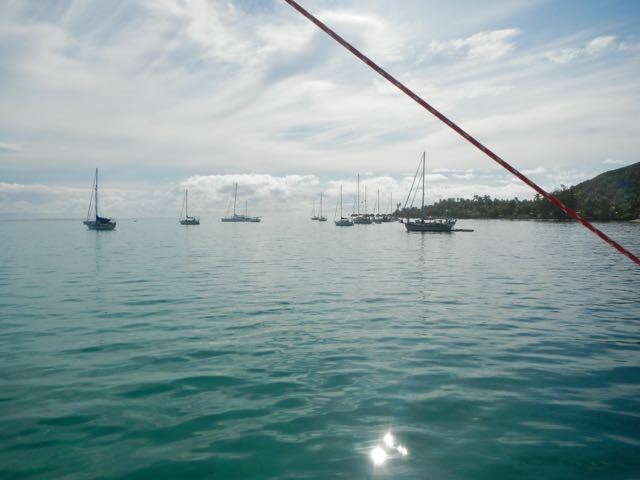 That huge mooring buoy in the foreground is held in place with the anchors in the previouis photo. 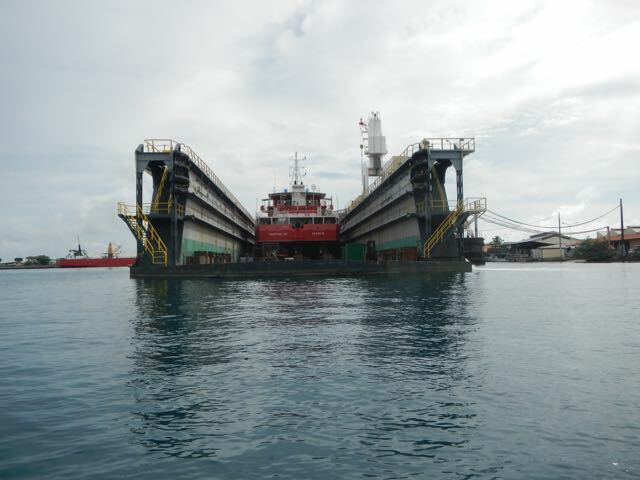 This is a dry dock. If a boat needs a lot of work on her bottom, they flood this box, the ship floats in, and the water is removed, leaving the boat high and dry. It's an ancient technique, but many haven't seen one. 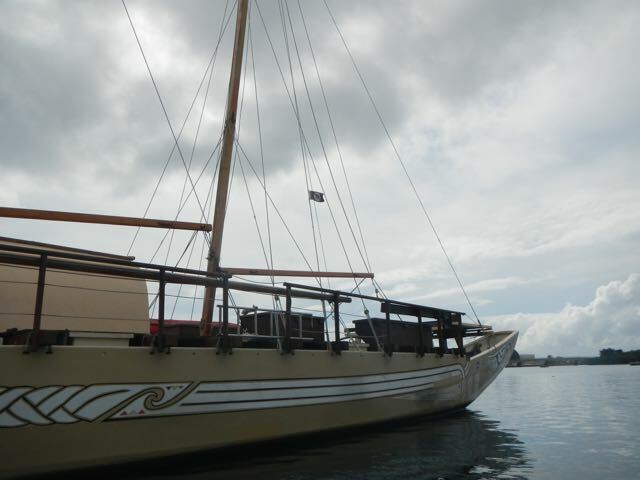 This is a traditional Polynesian sailing canoe, double-hulled, double-masted. 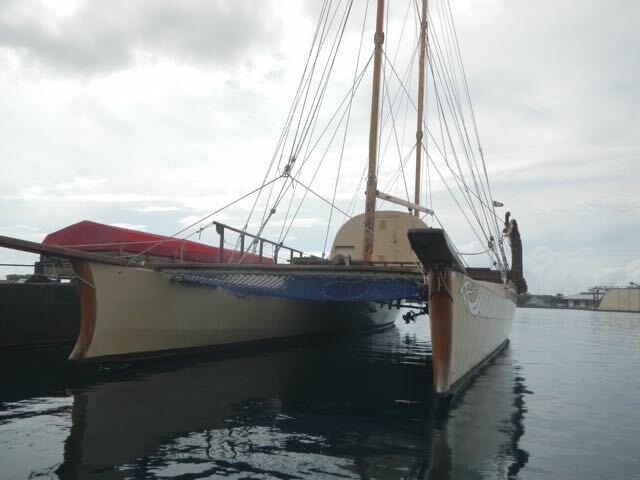 She's built of wood, but has an engine and some solar panels. Note her rigging. On our entry into Rarotonga, Cook Islands last year, we were stopped by FIVE of these things as we tried to enter the harbor! This motif looks Alaskan to me. It's obviously a whale, but it is similar to an Alaskan style. 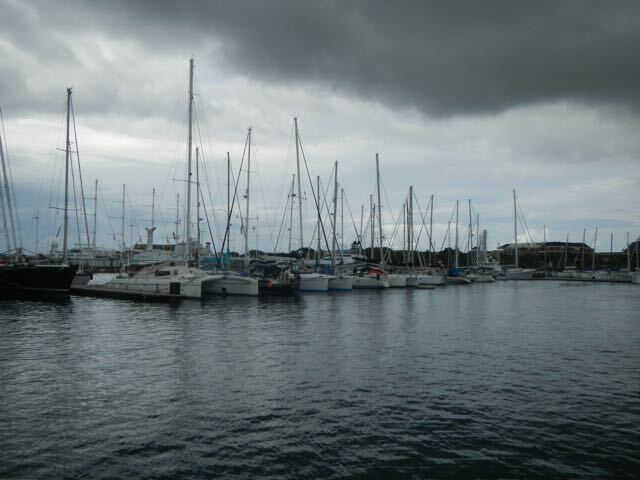 Marina du Papeete is a busy place. This is the new marina proper. 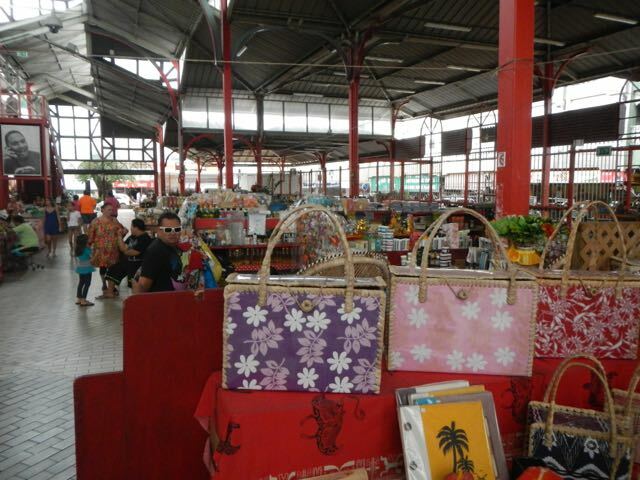 The world-famous market in Papeete is colorful and has treasures for almost any taste. Hmmm, Conni, are you sure? 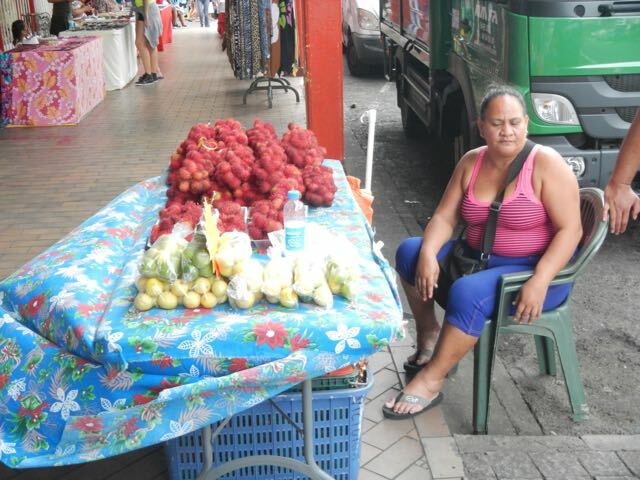 In the red bags are lychee nuts, the first real ones that I've seen. Wings, made fast to a noisey old dock. She's exposed to all of the waves and noise from ferries and cargo vessels. By the time that you see this, we'll have moved Wings across the open water at right and to the new section. 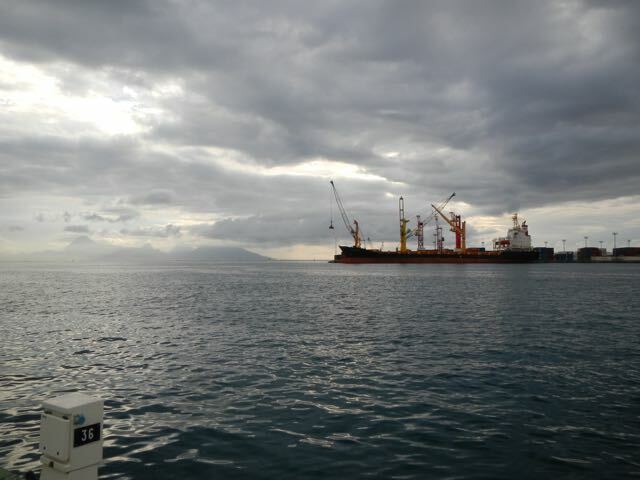 A cargo ship is unloaded across the harbor and Moorea dominates the skyline. The ship is very light since we can see her bow bulb. 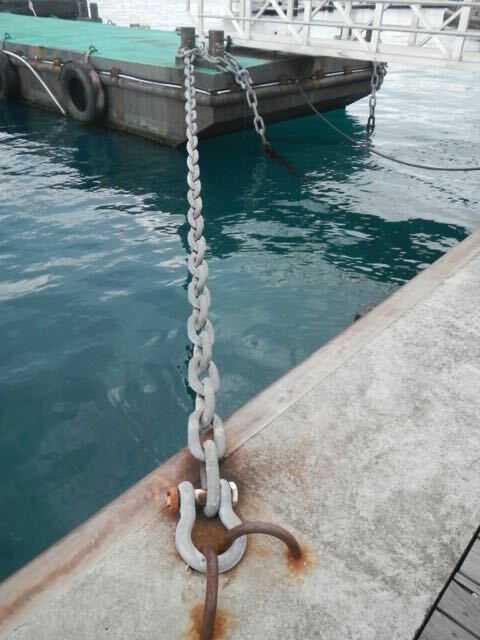 A HUGE shackle holds this huge chain that anchors our old dock. Hundreds of va'as (singular is va'a) are stored in this park. The yard stretches for a 1/4 mile. 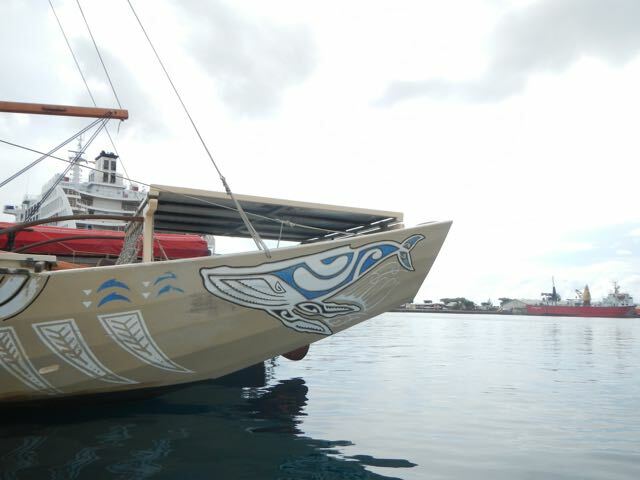 A va'a is a modern version of a single-hulled outrigger canoe. They're very popular for individuals and groups to paddle. 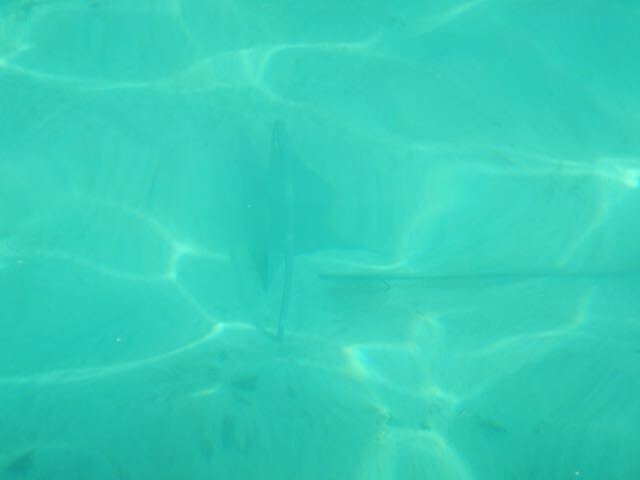 Their very narrow and sleek shape make them easy to paddle at speed. 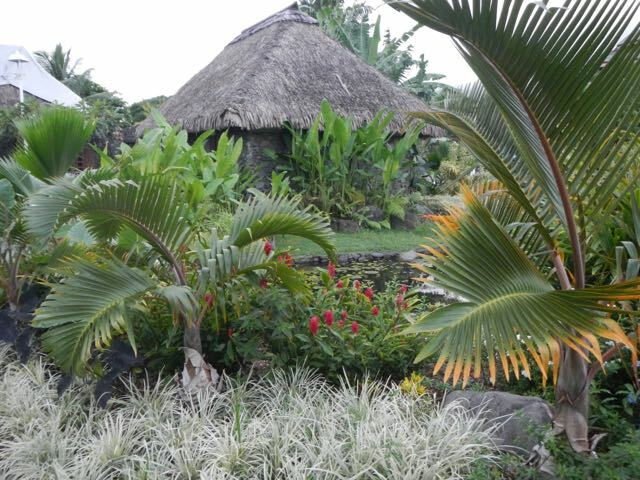 Papeete has many small gardens strewn about the city and this is one. Carrefour! 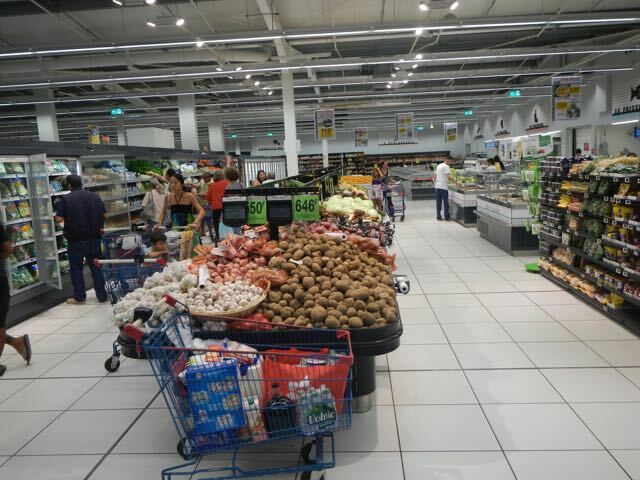 This is a first-world grocery store in which one might buy anything. 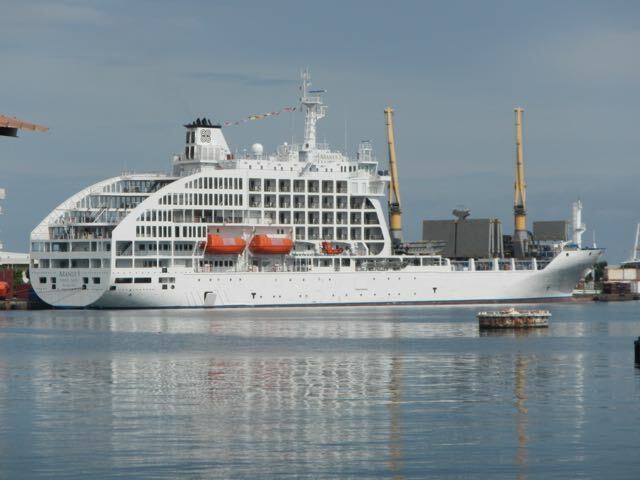 The Paul Gauguin slowly cruises into her dock. 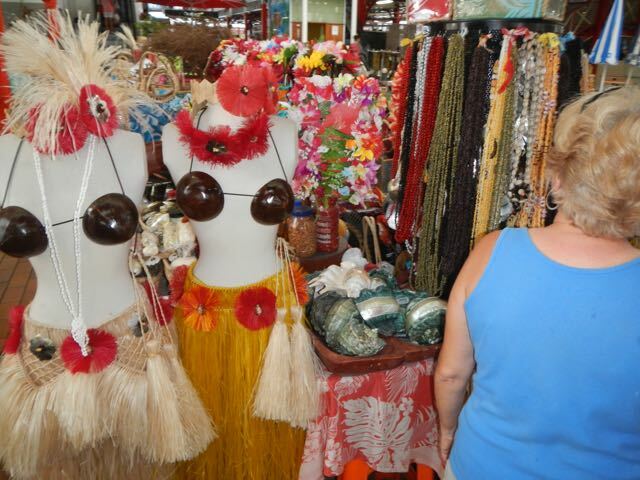 She plies the French Polynesia tourist trade for the season then returns to the US trade.